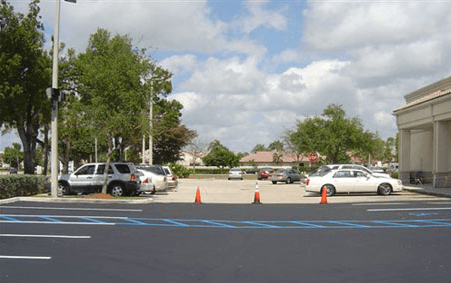 Once your parking lot or driveway is seal coated, we offer striping to show parking line spaces, pavement markings and other driver guidance on the pavement. ADA spaces using a DOT certified traffic paint. We also offer car stop installations. Need striping lines or car stops on your parking lot or pavement? Trinity Asphalt Paving company serves Dade, Broward and Palm beach counties from Davie to Delray Beach, from Boca Raton to West Palm Beach, From our asphalt paving headquarters in Loxahatchee, Florida. Call (562) 889-2615 for a free quote on your parking lot striping and or parking lot seal coating project!